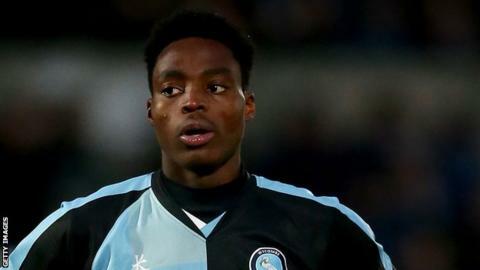 Fred Onyedinma made it two goals in as many games as league leaders Wycombe saw off York at Adams Park. The Chairboys were denied a bigger win by York keeper Bobby Olejnik, who was in fine form on his debut. Millwall loanee Onyedinma broke the deadlock after the break when he headed in following Sam Wood's volleyed cross. Marvin McCoy nearly equalised against his former side but home keeper Matt Ingram produced a superb save from the full-back's deflected shot. "It was a performance that we were worried about, we had a couple of ins and outs in the week. I was worried about this one as York's away form has been great. "Our first-half performance was great. And what a save from Matt Ingram at the end, he's really dug it out when he was called on. Today he was superb. "I thought we saw the game out really professionally which is really important." "I thought the best team won today, no qualms. "We did a lot better in the second half and we didn't create enough opportunities today but you've got to give credit to the opposition. "You can see why they're at the top end of the league. "We've always started games well, but we couldn't get a foothold in the game today and that's credit to Wycombe." Match ends, Wycombe Wanderers 1, York City 0. Second Half ends, Wycombe Wanderers 1, York City 0. Lindon Meikle (York City) wins a free kick on the right wing. Corner, York City. Conceded by Matt McClure. Substitution, Wycombe Wanderers. Matt McClure replaces Fred Onyedinma. Attempt missed. Fred Onyedinma (Wycombe Wanderers) right footed shot from the centre of the box is close, but misses to the left. Corner, Wycombe Wanderers. Conceded by Luke Summerfield. Attempt blocked. Sam Wood (Wycombe Wanderers) right footed shot from outside the box is blocked. Attempt saved. Fred Onyedinma (Wycombe Wanderers) right footed shot from the left side of the box is saved in the centre of the goal. Substitution, Wycombe Wanderers. Steven Craig replaces Aaron Holloway. Attempt missed. Wes Fletcher (York City) left footed shot from outside the box misses to the left. Substitution, York City. Carlton Morris replaces Russell Penn. Attempt saved. Fred Onyedinma (Wycombe Wanderers) right footed shot from the centre of the box is saved in the centre of the goal. Corner, York City. Conceded by Matt Ingram. Attempt saved. Luke Summerfield (York City) right footed shot from a difficult angle and long range on the left is saved in the top left corner. Corner, York City. Conceded by Josh Scowen. Corner, Wycombe Wanderers. Conceded by John McCombe. Attempt saved. Wes Fletcher (York City) right footed shot from outside the box is saved in the centre of the goal. Peter Murphy (Wycombe Wanderers) wins a free kick on the left wing. Corner, Wycombe Wanderers. Conceded by Femi Ilesanmi. Attempt missed. Marcus Bean (Wycombe Wanderers) right footed shot from outside the box is close, but misses to the left. Marcus Bean (Wycombe Wanderers) is shown the yellow card. Michael Coulson (York City) wins a free kick in the defensive half.